I was hoping to source some assistance in getting "Zon op Toon" working without the need for an expensive engineer to install extra hardware. PVOutput has a very rich API system which can be used to upload and retrieve data as well. 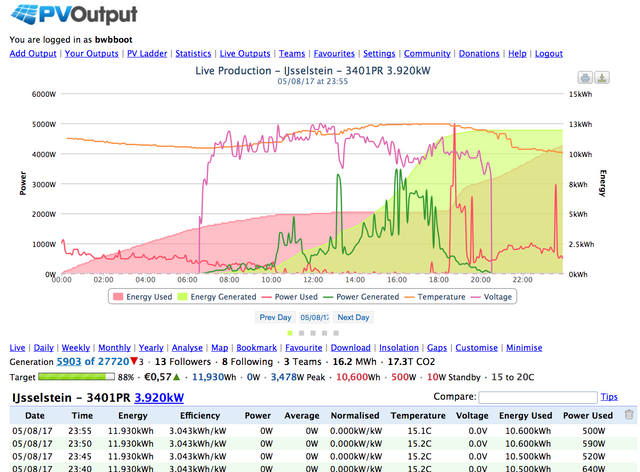 Now would it not be awesome to run a script that runs every 5 minutes and updates Toon's internals with the solar generation details as if it would using the official zwave meter that is installed by the engineer. Since i also upload my P1 meter information to PVOutput consumption fields are populated. This information is not so relevant here since it can be taken from Toon locally. Anyone here that would give it a try to get this information injected in to the Toon local system so that solar power (Zon op Toon) information is populated? Thanks for the suggestion. Looked at it indeed however as a second though this might not be the correct way to handle this. By updating the RRD databases directly you would miss out on all the logic that Toon applies. For example all calculations to graph consumption and generation correctly: generation-consumption=net delivery. What do you think? Assume the best approach would be to ingest data as if it would come from the meter installed by the engineer. Would need to somehow fake one in the system and then update its values. Unfortunately i don't have this meter installed and therefor the UUID is not generated . There must be a way to simply ingest the elec_solar_flow directly into Toon's internals by using a 'fake' flow meter. Any ideas on the approach would be welcome! The actual meaning of these files is stored in /mnt/data/qmf/config/config_hcb_rrd.xml. It should give at least an idea about the file formats, and how to work with them. Possibly there is a way to update values by using the /qmf/bin/bxt binary. Trying various options to see if I can make it work. note: -r needs to be specified *after* -d! the option combo '-a x -v y' can be repeated! I like the idea of importing the Smart meter data or converter data directly into Toon, importing via Domoticz can also be an option. Domoticz already has a method to read data from PVOutput or SBFspot build-in. The smart meter data are already there, stored in a bunch of .rra files. If we take the path to custom kernels, we could also build SFBspot for toon an run everything locally. The custom kernel would be required to add bluetooth support to toon. Marcel, would you be able to create a script that updates the solar part of the .rra files using the PVOutput CURL method i posted before? Writing valid files is quite different from reading files and converting them to a format of your choosing. Data need to be synchronized with toon's clock, resampled to 5 minute intervals, and then written. (when I was writing the serial IO between toon and boiler module, I spent most of the time in finding the package checksum calculation methods and seeds). The UUID of each of the files changes with every restart, so that's a bit of thing too. Before you know it, you're knee deep in a swamp filled with all kinds of libraries, timing issues and unexpected features that need sorting, and then write it up in C or something similar. Might not be as simple as it looks. Last edited by bwbboot on Sun Aug 06, 2017 8:56 pm, edited 1 time in total. What you could do is feed S0 pulses from the inverter directly into the meter adapter, and then activate zon op toon, no extra kWh meter required. I can get you the wiring specifics if needed. This requires an inverter that generates those pulses. Yes interested. This works by using the existing P1 meter? My inverter does not support s0 pulses but can try to convert the data to s0 pulses using my RPI. You will need a recent meteradapter. PN: 6599-1500-0201, or later. (mine is from 2015, SN starts with 15). I will try and dig up the schematics (nothing fancy, but it's somewhere in the attic, may take some time to find). I did some googling and its going to be too much hassle to get it to work using s0 pulses (in my case, since my inverter does not have a s0 pulse output). Looks like i need to keep investigating options to update values directly into toon. I think it's possible to fill the databases through bxt calls. Someone will need to dig deeper into that to get it to work. However, it's not very high on my priority list right now, I'm afraid.